Who doesn't love flowers? These are custom-made by your very favourite little artists just for you! 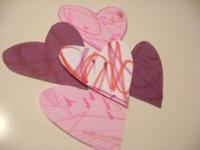 Valentine's Day is a great time to reinforce learning about heart shapes too! 1. Gather your materials. 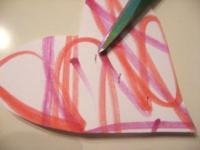 You will need some card stock or stiff paper, markers or crayons, pipe cleaners, and scissors. 2. 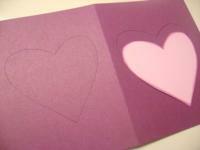 Start by drawing a heart on the card stock, cut it out and use it as the template to draw more on the other card stock. 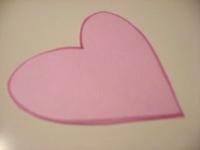 You can simply draw the hearts individually too. 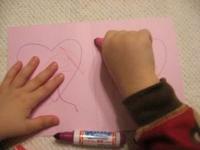 If children are old enough have them draw the hearts! 3. Have children color the hearts. We chose other red and pink colors for drawing but any color marker or crayon will work! 4. 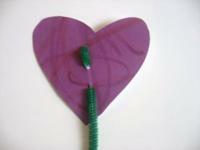 Make 3 small holes with sharp scissors or a very small hole punch in the heart. 5. Thread the pipe cleaner through. This is great for fine motor development, but really little hands will need help. The pipe cleaner should have some extra after being threaded through and you will bend that to secure it. 6. Repeat steps 4 and 5 for each heart. 7. Older children can write messages in black pen on the heart or you can have children dictate a Valentines message for the recipient. 8. 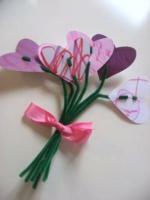 Children tie a pretty bow around their stems and give it to someone they love!